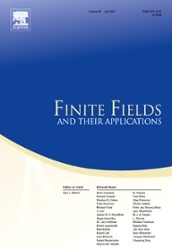 The paper by Sandro Mattarei and Marco Pizzato, Generalizations of self-reciprocal polynomials, has been accepted for publication in Finite Fields and Their Applications. Abstract: A formula for the number of monic irreducible self-reciprocal polynomials, of a given degree over a finite field, was given by Carlitz in 1967. In 2011 Ahmadi showed that Carlitz’s formula extends, essentially without change, to a count of irreducible polynomials arising through an arbitrary quadratic transformation. In the present paper we provide an explanation for this extension, and a simpler proof of Ahmadi’s result, by a reduction to the known special case of self-reciprocal polynomials and a minor variation. We also prove further results on polynomials arising through a quadratic transformation, and through some special transformations of higher degree. This entry was posted on August 29, 2017 by Sandro Mattarei in New publications, News and announcements.